Thirsty Thursdays: Favorite New Couple!!!! 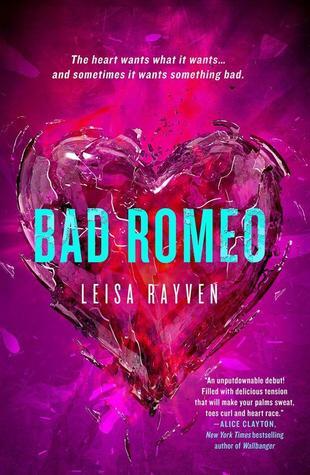 My new favorite couple is Ethan Holt and Cassie Taylor from Bad Romeo by Leisa Rayven. Seriously tho…this couple put me through the emotional wringer and I floved it! If you missed my review on Monday you can read it here. I just can’t recommend this book enough. Please, please read it! Tell me who your new favorite couple is!!! This entry was posted in Book Crushes, Book Recommendation, Books, Favorite Authors, Favorite Books, Leisa Rayven, New Adult, Thirsty Thursdays and tagged Book Crushes, Book Recommendation, Books, favorite authors, Favorite books, Leisa Rayven, New Adult, Thirsty Thursdays. This book is next on my list to read. Can’t wait! I loved this book! So much angst, emotion, sexual tension. Gah! Can’t wait for the sequel.